Today’s Gospel (Mark 1:40-45) is about Jesus reaching out his hand and touching a leper. In spite of the fact that we know of leper colonies in recent history, we often gloss over passages like this without really being impacted as we should. 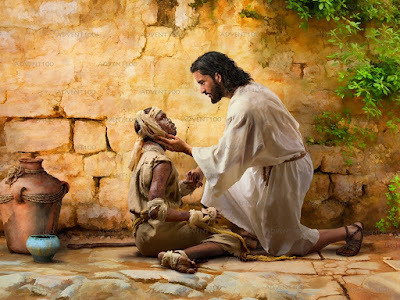 The loveliest thing is that Jesus didn’t see a leper at all; he saw one of God’s dear children in desperate need, and he released a torrent of healing love into his life. So, throughout its history, the Church, for all of its faults (which admittedly are many! ), has cared for the sick and dying in a way that has helped them know dignity and love. And not just in the sacramental and spiritual aspects of the healing ministry: it was the Church that first established hospitals and hospices! But, in spite of what we read in the Gospels, it is sadly not unusual to hear of church people (and other people, too) punishing their children for not being "up to scratch" by pushing them away, out of their lives. Practising Christian parents must get across to their children that however wayward they might be, and whatever mistakes they might have made, and wherever they are on their faith journey, they are deeply loved with an everlasting love, and that no situation exists where healing cannot happen. The hand of Jesus is never out of reach. Church leaders also need to take this on board, especially those who, like some of the religious leaders in the time of Jesus, tend to be highly judgmental of others who have messed up their lives (i.e. as if we haven't ALL done that in one way or another! ).